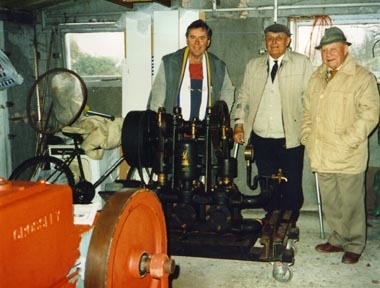 Picture - Cliff Whalley (right) and Bert Howell (centre) advise Bruce Osborne on restoration, 1995. Produced by and copyright of the authors. 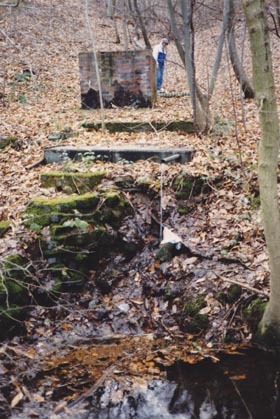 The Owls Hole Pump and Engine, 1995. <?xml:namespace prefix = "v" ns = "urn:schemas-microsoft-com:vml" /><?xml:namespace prefix = "w" ns = "urn:schemas-microsoft-com:office:word" />The Owls Hole Pump once pumped spring water from the <?xml:namespace prefix = "st1" ns = "urn:schemas-microsoft-com:office:smarttags" />Malvern Hills to the area around British Camp. 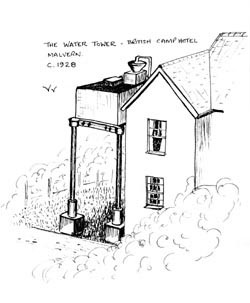 The water was the principal supply for many houses in the neighbourhood including, between 1947 and 1955: The British Camp Hotel (Mr & Mrs Long) and swimming pool, Beacon Lodge (Mrs Drummond and Miss Turner), Toll House (Mrs and Mr Somers), Windy Acre (Professor and Mrs Nicholls), The Pleck (Mrs and Mr Byrd) and Wynds Point (Dame Cadbury). The supply ran from the pump, by 2 inch main, to an underground valve chamber across the road from Wynds Point Spout. Valve "A" controlled the Ledbury Road properties and "B" Wynds Point and the Hotel. From there it went to roof tanks at the individual properties and the water tower, which was situated alongside the rear of the British Camp Hotel. Each tank had a water level indicator and was filled separately by the water company operative. The pump also supplied the open air swimming pool, once a popular visitor venue at the British Camp Hotel. The water tower had a 2,000 gallons capacity and was at roof level, supported on legs. It was a galvanised tank up until about 1950 when it was replaced by a Sectional Braithwaite Tank, installed by the brewery. Reservoir Cottage at the British Camp reservoir was occupied by Mr L B Howell (the resident operative) and Mrs Howell. Their water was supplied by the back pressure of the pumping main during and after pumping operations. In 1946 water was charged at 5/- per 1,000 gallons, with users each having meters. In the late 1960s this arrangement was replaced by a public main extension from Jubilee Drive in spite of Owls Hole Spring never apparently running dry. The Owls Hole pump is a triple throw, reciprocating, open crank, positive displacement pump. Numbered 84135, it was made in 1927 by Joseph Evans, Engineers of Wolverhampton and was likely installed at Owls Hole about that time. Being a ram type pump it required an "open end" distribution network, hence the earlier mentioned water tower. It served the local community for about 40 years until the main was laid from Jubilee Drive. Evans were long established pump manufacturers and two of their pumps, dated 1887 and 1888, can be seen at the Waterworks Museum, Hereford. 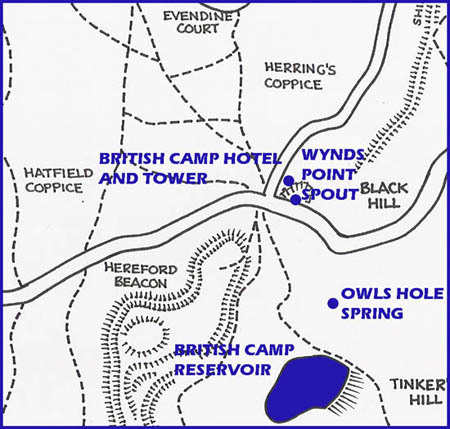 The pump was located in an asbestos and iron pump house by the spring in a steep valley, known as Owls Hole, to the east of British Camp and to the north of the British Camp reservoir. At the time of its installation, c.1927, the pump was powered by a Crossley PO 1050 paraffin engine. Later there was a gas engine located in a shed a short distance away, supplied by a 3 inch gas main. After the second World War the pump was belt driven by a vertical single cylinder, two stroke, tank cooled, Crossley, VO6, 7-8 hp diesel engine. Fuel was fed by gravity from a wall mounted tank and starting involved inserting a lighted wick into the combustion chamber before swinging with a handle. T he Malvern Hills District Council Water Dept. maintained the pump in the 1940s. By the 1960s they had become the South West Worcestershire Water Company. Bert Howell managed the pump house from 1 July 1946 eventually retiring in 1979. A Mr Judson was the water engineer and Tim Brazier stood in from time to time when the regular operative at British Camp was unavailable. Assisting Bert Howell in the later years was John Hiles. Pumping was usually for about four hours each day, excluding Sundays, at a rate of 600 gallons per hour. Cliff Whalley was the superintendant. The isolated pump house was only ever lit by gas. Nearby, the spring which supplied the pump still flows into a blue brick chamber and then into a series of reservoirs, now derelict. Picture: The Pump House at Owls Hole, 1994. The pump remained in situ until 1994 when it was removed for renovation. By then it had deteriorated considerably and suffered severe frost damage, which had caused one of the pistons to burst. The pump is now restored to workable order and made its debut when it was put on display for the launch of Aquae Malvernensis* at the Great Malvern Winter Gardens in November 1994. An electric motor was used to reciprocate the pump at the time in the absence of a power unit of suitable type and vintage. During field research a further discovery was the original 1927 Crossley paraffin engine lying disused at British Camp. During further field work an important discovery was made at British Camp Reservoir where the pump engine was spotted lying unused. 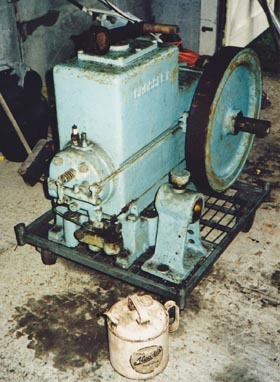 After negotiations with the owners Severn Trent Water, the original Crossley PH 1050 engine was recovered from British Camp Reservoir water filter station in February 1995. 129367. BHP 7. REVS 500. TYPE PH 1050. CROSSLEY BROTHERS LTD, OPENSHAW, MANCHESTER, ENGLAND. The engine is a fully-enclosed petrol/paraffin engine built at the Crossley Elstow Works, Bedford. The engine operates on the four stroke cycle with a single horizontal cylinder. It was introduced around 1925 as the 1030 to 1050 range which included 2/2.5, 3/3.5 and 7 hp models. The engine has both inlet and exhaust valves operated by a single rocker and rod driven by enclosed timing gears. Ignition is by a BTH magneto which is chain-driven from a sprocket wheel on the crankshaft. There is a centrifugal governor situated by one of the two fly wheels. The paraffin fuel, housed in the base tank, is drawn by suction of the piston through a passage in the cylinder head and vaporised before entering the combustion chamber. Initial running is on petrol, switching to paraffin when the engine temperature rises. When recovered from British Camp, in a derelict state, the engine was painted sky blue over green over red, a treatment which appeared to have been largely applied since the engine last ran, paint being present on the sparking plug thread which was only partially screwed home. In addition there was oil in the petrol chamber, suggesting that earlier attempts to restart it had been fruitless. The engine was free to turn but had clearly not run for some time. It is believed that the engine had lain derelict for many years after being used to drive a fan in the building from which it was recovered. The engine had been painted merely to blend in with other equipment rather than go to the trouble of removing it. 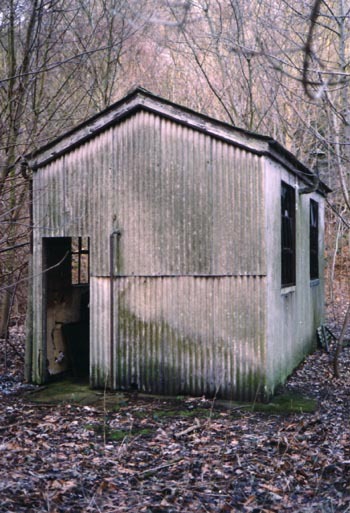 The filter house, from where the engine was recovered, was used to supply water by pumping or gravity feed, dependent on the reservoir level, to the Lower Wyche filter and chlorination plant and then to the service reservoir. We are grateful to Severn Trent Water for allowing recovery of the engine as well as the Owls Hole pump for restoration. Restoration of the engine commenced after rescue and the unit was successfully run on paraffin in March 1995. In order to provide a more stable mounting for the engine, a trolley was then constructed and ancillary items such as belting obtained. 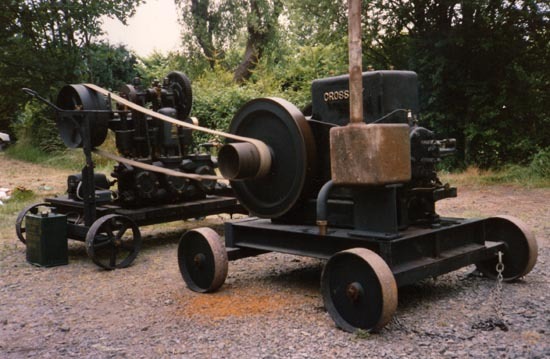 The restoration work was completed and on May 15th 1995 it was decided to align the Crossley engine with the Owls Hole pump, start up the engine and belt drive the pump for the first time in 50 years. This was a memorable occasion and the culmination of extensive local history research as well as engineering work. The reuniting of the pump and engine was an immediate success and it was as if two close friends had come together again after an extended forced separation. During the investigations, several retired water company employees, who knew the installation, were able to give invaluable advice. Bert Howell had serviced the facility after the war and was particularly concerned that we were complying with the appropriate maintenance procedures, although it was in excess of 30 years since the pump had operated! 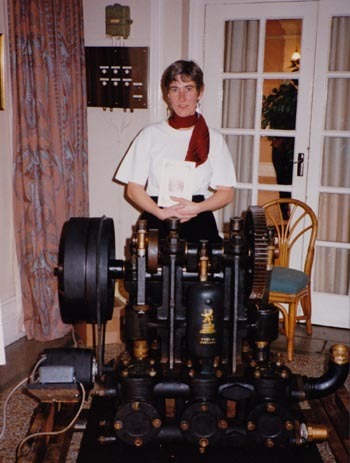 In the 1990s - Cora Weaver and the pump at Malvern Winter Gardens for the launch of Aquae Malvernensis*; here the pump is driven by an electric motor. 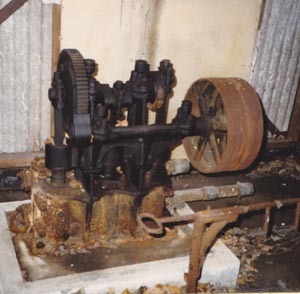 Following years of public display and demonstration the pump and engine where in storage for 10 years. However since 2014, are now on permanent loan to John Clifford. John is a tractor and engine enthusiast and lives near Malvern. He would be very interested in contacting other owners of PH 1050 engines or Evans pumps. He also still need a number of minor parts. The next stage is perhaps to incorporate a large tank with the pump and engine and restore the entire facility to pumping water. Does anyone know of the whereabouts of an unwanted 2,000 gallon tank in The Malverns together with related superstructure? 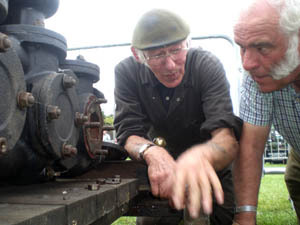 Picture right - The two Johns - John Hiles who worked on the engine as a young man and John Clifford discuss future plans for getting the pump to actually pump water again. 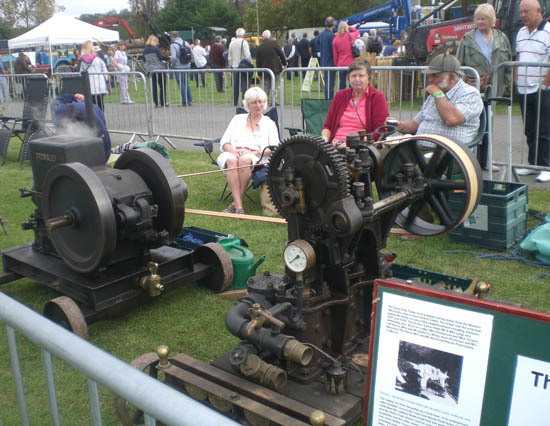 The pump and engine at the Three Counties Showground September 2014 under the watchful eye of John Clifford. Click website below to see details of the Owls Hole Spring.